"Peaches are spruced up with a little honey and a dash of cinnamon before being packaged into foil and cooked on the grill. As my husband says, these taste like a peach cobbler without the crust!" Place peaches onto a large piece of aluminum foil. Use two if necessary to hold in all of the peaches without spillage. 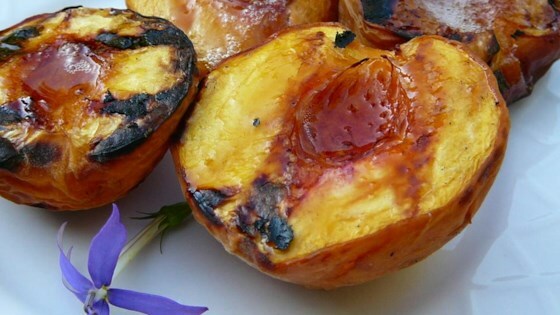 Drizzle the honey over the peaches, and sprinkle with cinnamon. Close up the foil, sealing tightly. Place the foil packet onto the preheated grill, and cook for 10 minutes, turning once halfway through. Carefully open the packet, and serve. Cheesy and fruity, irresistible grilled appetizer. it was okay, I'd try it again because it was so simple, but i'd follow any suggestions given. Delicious...but I added some sugar to them before grilling to get better color. We added some vanilla ice cream. Thanks for a delicious dessert. Add a little brown sugar and butter to give this a richer flavor if desired. I made this with fresh peaches. It was wonderful! Very simple and wonderful flavor. I actually used fresh peaches instead of frozen. This would make a wonderful fall dessert.